Hi guys! We are up to 2013 in my series on the Animated Oscars and I have a special treat for you! 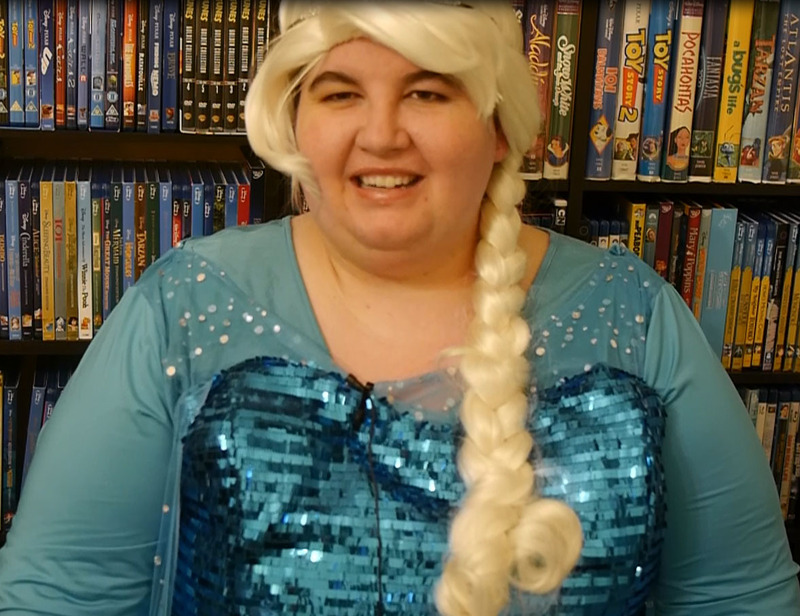 Queen Elsa has come to visit to review all 5 films! I admit in my review for the Disney Canon of Frozen I was a little defensive and perhaps overly concerned with trolls. This time I took a different approach and just decided to have fun with it. I know people feel all kinds of ways about Frozen and I explained it as best as I could. But there are plenty of great animated films for everyone so hopefully you can enjoy hearing my thoughts on one I enjoy. The other 4 films are also worth seeing (no Shark Tale skunks in this year!). Ernest and Celestine- Done by some of the same team that did The Illusionist and The Triplets of Belleville. This is a watercolor sketchbook style story about an unlikely friendship between a mouse and a bear. They kind of become bandits and the friendship evolves over time and then when both are put on trial they teach their societies something important about love, labeling and racism. A real gem of an animated film (and can also be very funny). Despicable Me 2- I think the Despicable Me movies are just ok and I wasn’t a big fan of Minions, so I wasn’t sure what I’d think of Despicable Me 2 on the rewatch. I think the disappointment of Minions actually made me appreciate this film even more. It has a lot of solid laughs, which didn’t happen in Minions. I really like seeing Gru with the 3 little girls and being an overprotective Dad. The Minions are also funnier in small doses than the main attraction. It’s no masterpiece but a decent comedy for kids. The Wind Rises- The strongest competition for Frozen. A great film that just gives us the life of a man and we decide what we think of him and his dreams. It is a story about hope and how a dream can carry you through tough times. It is a magic-free film from Miyazaki about the life of a airplane designer named Jiro during World War II. It made my top 50 animated countdown so clearly I love it. It goes without saying the animation is stunning. The Croods- This was a new one for me from Dreamworks. I’d heard bad things about the film and you know what? I actually enjoyed it. I liked it was about a family and thought the script was pretty funny. I liked how the created new animals and world for them to meet. It made it unpredictable and surprising. I liked the voice cast especially Nicholas Cage who has a freak-out even animated! It’s not a masterpiece but liked it a lot more than I thought I would. < Is Animation for Children? It still was a terrible year for animation. In another year Despicable Me and The Croods would have never made the list. Really, in any other year I would have thrown a fit over Frozen winning…but with all the other studios slumping into mediocrity (or worse). Animat declared no less than five movies pieces of garbage and gave the seal of approval exactly once, and that was for Frozen. Still think that the movie belongs on the bottom of the Disney Princess barrel. It’s like Pocahontas, the only thing which rescues it is the soundtrack (as badly as the songs are used) and some really impressive animation. So do you think Wind Rises and Ernest and Celestine aren’t worthy of nomination? I think they are both very good. I still haven’t gotten around to watching Wind Rises (I suspect that when I do I might start raging against Frozen winning). Ernest and Celestine is worthy of nomination, but it is not ambitious enough that I would have given it the win. They are so different that it is tough to compare but Wind Rises is a wonderful film. Made my top 50 animated films so clearly I love it. Very different film for Miyazaki and great way to go out. The biggest slight in the academy I feel is no nomination for Joe Hisaishi. His scores for the Ghibli films have been amazing going all the way back to the early days. Wind Rises is no exception. Thanks. I had so much fun putting everything together. Awesome review once again! Also, I like your Elsa hair and costume. I never saw Ernest & Clandestine or Wind Rises. So I’ll try to check those out soon. Despicable Me 2 I enjoyed but I agree with you about Monster’s University being better (even though Lucy is really good looking). The Croods, I’ll say is definitely one of DreamWorks better films for sure, along with Prince Of Egypt, Road To El Dorado, Spirit: Stallion Of The Cimarron, Sinbad, Shrek, both Kung Fu Pandas, & both How To Train Your Dragons. Just curious, is Wind Rises Miyazaki’s last film because most of his films, except for Spirited Away, didn’t do too well at the box-office? Thanks so much! I had a ton of fun making this video. Glad you see some value in these films including The Croods. Honestly not sure why that gets hated on so much. When Dreamworks makes an enjoyable film I will give them full credit for it. I didn’t think Miyazaki’s films had done that badly but I don’t know the statistics. But the reason it is his last film was because he I believe is in his late 70s. SwanPride for looking mainly at the US box-office and not the foreign one as well. Anyway, I guess I wouldn’t say that the other theatrical released anime films didn’t do well at the US box-office, but they just weren’t as popular as Spirited Away. Oh well! Really, The Croods has been hated a lot? That’s a shame because I liked it a lot and I know quite a few friends of mine did too. Anyway, glad to know that you liked it, along with most, if not all, of the Animated Oscar nominees. For some reason I thought Ponyo had done better in US but I guess not. Anyway, they certainly all do well enough to justify the studios existence if thats what they want to do. Hopefully it will come back. If it’s any consolation, I’m an animation fan too. So are my friends Ian, Ashton, Lucas, & a few others. Animation fans may be mine too even though technically, we’re not suppose to select favorites among people. Oh well! Anyway, great review again! Curious to see what you think of 2014 & 2015. He was simply retiring. But in the wake of his retirement, Studio Ghibli announced a “pause” from making animated features, so who knows if we ever see a Studio Ghibli movie again. It is not correct that the movie didn’t do well in the box-office. You have to look on the Japanese numbers, not the American ones. It is kind of expected that foreign movies don’t do well in the US because, well, the US audience is very Hollywood oriented. Spirited Away was a welcome exception, but the movie was actually released in Japan years before it was shown in the US. Well we technically got 2 after Wind Rises from Ghibli but it was last from Miyazaki. What surprises me is you’d think theyd be nurturing new talent to take over when Miyazaki and Takahata left but hopefully some of those younger talent will come back and it will be just a pause. Fingers crossed. I’m not up on my box office stats but I think you’re right on in your analysis there. Well, Princess Kayuga actually was a box office flop, which might be one of the reasons for the hiatus. Or not. Perhaps they are really just unsure about the direction of the company. Like you, I believe The Wind Rises is the only competition for ‘Frozen’, but I haven’t seen it yet, so I’d probably still give it to Frozen. I still think Monsters University is the better film out of it and Frozen, but out of the ones nominated, Frozen absolutely deserved the award. The Croods is good at best, and I do not really understand why it or Despicable Me 2 (which has always been nothing above mediocre) got nominated. Monsters University should have been nominated over one of them. This year was a very weak year of animation overall. I liked The Croods a lot but agree Monsters University is better than it and certainly better than Despicable Me 2. I definitely don’t think it is better than Frozen. What do you think of Wind Rises? I LOVE it so to me it is about equal with Frozen. Ernest and Celestine is also very sweet and a bit saucier than you expect given the graphics style. I have not watched Wind Rises. Oh it’s fantastic. You’ve got to see it!